Taking pictures of the Heins family is always so much fun for us! We know Bunny and Heather (and Colleen!) from the volunteer work we do with the Blacksburg Volunteer Rescue Squad, not to mention that we are practically neighbors. This family of three is one of our favorite families to take pictures of and let's be honest, also just to hang out with!! When we decided to have the session at Pandapas Pond, it made me smile. 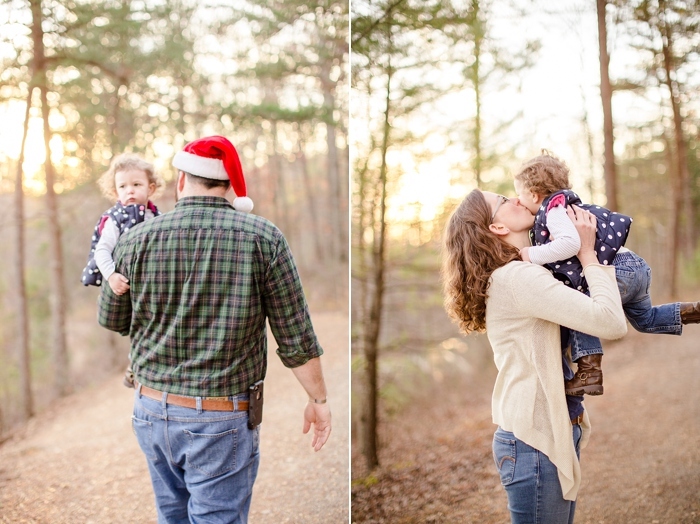 For one reason Pandapas Pond is one of our favorite places to take pictures but mostly because it reminded me of Will's first session with Bunny and Heather close to four years ago!! I can't believe we have been around for so many big events in their lives and that we get to spend so much time with them and capture their family year after year! What a blessing it has been! We lucked out with balmy weather for December in Blacksburg and a PERFECT sunset through the sparse trees. Colleen is starting to be a confident mover which made this session interesting! She wanted to be moving the whole time! So cute! I remember our family session with the Heins's last year when we sat Colleen down in ivy for a few pics and she couldn't do a thing about it. How time flies! I hope you enjoy some of our favorites! I caught myself gitty-smiling while I was going through these! Isn't she cute!! Look at that smile! The stairs were her favorite of everything in the park!